The Alfa Romeo Stelvio has compact proportions with a steeply raked rear hatch. Alfa Romeo is betting on the Stelvio's fun-to-drive characteristics to boost the appeal of what is expected to become the brand's best-seller. "In the Stelvio you find the pure spirit and the DNA of Alfa Romeo," said Alfa Romeo's Europe chief, Fabrizio Curci. The Stelvio has the shortest steering ratio (12 to 1) in its segment, which helps to give it handling similar to a sports car, Alfa said. 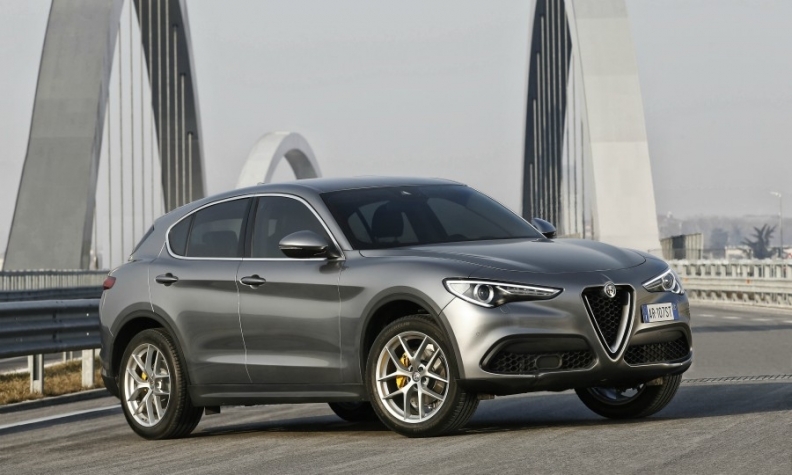 Alfa’s engineers succeeded in their target of giving the Stelvio a weight balance of 50-50. To reduce weight many body components are aluminum while the drive shaft to the rear axle is carbon fiber. Despite this, at 1735kg the Stelvio weighs more than rivals such as the aluminum-intensive 1690kg Jaguar F-Pace. The Stelvio, named after an Italian mountain pass in the Alps, is based on Alfa’s Giorgio platform like its sedan sibling, the Giulia. Passengers in the Stelvio sit 190mm higher than in the Giulia, said Alfa’s chief engineer, Roberto Fedeli. The 4690mm-long Stelvio will compete against midsize premium crossovers including the Porsche Macan, BMW X3, Audi Q5 and Jaguar F-Pace. Four-wheel drive was standard in the launch models with torque distribution set at 100 percent to the rear axle, although a maximum of 50 percent can be sent to the front axle. A rear-wheel -drive entry-level model will be added later this year. Interior quality and the materials are good, but not at the same level as a Q5. The luggage compartment holds 525 liters, which is more than the Macan and Mercedes-Benz GLC but less than the X3 and Q5. Target buyers: Customers who want to stand apart from German premium brands. Engines: Alfa says the Stelvio's 280-hp 2.0-liter gasoline engine offers best-in-class acceleration, going from 0 to 100 kph (62 mph) in 5.7 seconds. Later this year a 200-hp version will be offered. The 210-hp 2.2-liter diesel engine will be joined by an entry-level 180hp alternative with rear-wheel drive only. Technology: The Stelvio's electromechanical system that combines stability control with a traditional servo brake is a segment first, Alfa says. It eliminates pedal vibration to give a better driving "feel" and allows a much shorter braking distance.